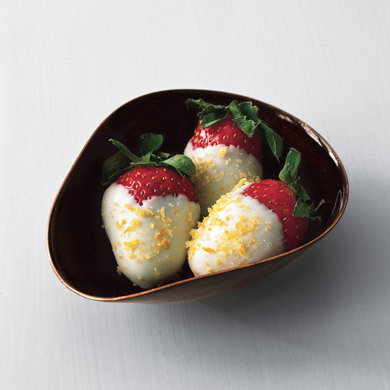 Make sure your strawberries are clean, completely dry and at room temperature before you start dipping them in the chocolate. This way you won't end up with water under or over the chocolate. Finally, the color of your strawberries is very important. Look for those that are red almost all the way to the hulls so you can dip them the most into the chocolate and also so the contrast with the green leaves of the hulls. Have a fun Tuesday and hope you got "chocolated" out yesterday! Room temperature - genius. I think that must be what I've done wrong in the past, thanks! um with pistachios! i HAVE to try that. 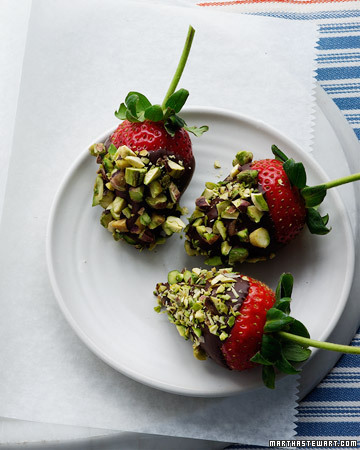 I never thought about dipping strawberries with pistachios but it looks like the perfect combination - I'm with Audrey, going to have to try that one out! Oddly, I've never been a big fan of chocolate covered strawberries (or fruit in general), but maybe I just haven't tried the right combination yet. What a wonderful way to celebrate Valentine's Day, and thank you for the terrific tips! Chocolate covered strawberries sound divine! These look so good! Salivating over here. Oh! One of my favorites! Happy Valentine's Day! Mmm I LOVE chocolate covered strawberries! Sounds like so much fun. Thanks for sharing the great tips with us! This is definitely one of the best combinations...chocolate + strawberries! Yummy! mmmmy mouth is watering! awesome tips! as per usual!